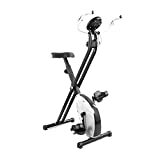 The “We R Sports” Folding X-Frame Exercise Bike has a folding frame for convenient storage. A height adjustable padded saddle and large self-presenting pedals with adjustable toe straps ensure correct body placement during use. To plan and track your exercise progress the “We R Sports” Folding X-Frame Exercise Bike also has a 6-function exercise monitor. Get in shape now in the comfort of your own home!